Language poetry—and to my mind the best Language poetry was written in prose—was a machine that ran on difficulty. Reading a prose poem deploying what Ron Silliman called “the new sentence” was intended to be an exercise in frustration: the reader attempts to combine the sentences—which are grammatical—into meaningful paragraphs. The sentences are vague enough (“Sentence structure is altered for torque, or increased polysemy/ambiguity”) that a logical relation between sentences will always almost seem possible. But the reader discovers as she goes that many successive sentences cannot be assimilated to a coherent paragraph, that paragraphs are organized arbitrarily (“quantitatively,” as opposed to around an idea), that no stable voice unifies the text, that her “will to integration”—her desire to produce higher orders of meaning that lead away from the words on the page into the realm of the signified (“a dematerializing motion”)—is repeatedly defeated. The solicitation and then tactical frustration of the reader’s will to linguistic integration had an explicitly political object: it was advanced as a kind of deprogramming of bourgeois readerly assumptions. Such difficult prose would teach us that meaning is actively produced, never naturally given; that language is manipulable material, not a transparent window onto reality; that the “speaker” is a unifying fiction more than a stable subject; and so on. These deconstructive strategies were conceived not only as a critique of other writers—for example, lyric, “confessional” poets with their privileging of subjective experience and inwardness; mainstream novelists with their “optical realism”—but as an attack on existing social and political orders that depended upon the smooth functioning of dominant linguistic conventions. Many of us learned something from the Language poets’ taking up of a constructivist vision of the self and its literature: their insistence on language as material, their combination of Russian formalism and various strains of French theory into a compelling reading of experimental modernism. (And many of us learned to appreciate certain texts associated with Language poetry in terms other than and often opposed to those provided by essays like Silliman’s “The New Sentence,” with its anti-expressive and anti-aesthetic bent). But who among us still believes, if any of us ever really did, that writing disjunctive prose poems counts as a legitimately subversive political practice? Indeed, for many ambitious contemporary writers, disjunction has lost any obvious left political valence. Does the language of advertising and politicians, for instance, really depend on seamless integration? Transcripts of speeches by Bush or Palin or Trump would have been at home in In the American Tree. When aggressive ungrammaticality and non sequitur are fundamental to mainstream capitalist media (and to the rhetoric of an ascendant radical right), the new sentence appears more mimetic than defamiliarizing. 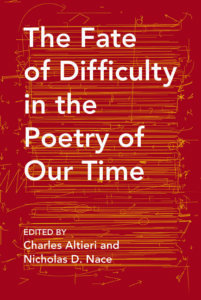 In this context, “difficulty” as a valorized attribute of a textual strategy gives way to the difficulty of recovering the capacity for some mode of communication, of intersubjectivity, in light of the insistence of Language poets (and others) on the social constructedness of self and the irreducible conventionality of representation. Language poetry’s notion of textual difficulty as a weapon in class warfare hasn’t aged well, but the force of its critique of what is typically referred to as “the lyric I” has endured in what Gillian White has recently called a diffuse and lingering “lyric shame”—a sense, now often uncritically assumed, that modes of writing and reading identified as lyric are embarrassingly egotistical and politically backward. White’s work seeks, among other things, to explore how “the ‘lyric’ tradition against which an avant-garde anti-lyricism has posited itself . . . never existed in the first place” and to reevaluate poems and poets often dismissed cursorily as instances of a bad lyric expressivity. She also seeks to refocus our attention on lyric as a reading practice, as a way of “projecting subjectivity onto poems,” emphasizing how debates about the status of lyric poetry are in fact organized around a “missing lyric object”: an ideal—that is, unreal—poem posited by the readerly assumptions of both defenders and detractors of lyric confessionalism. It’s against the backdrop that I’m describing that I read important early 21st-century works by poets such as Juliana Spahr (This Connection of Everyone with Lungs), Claudia Rankine (Don’t Let Me Be Lonely: An American Lyric and, very recently, Citizen: An American Lyric), and Maggie Nelson (Bluets). I mean that these very different writers have difficulty with the kind of difficulty celebrated by Language poets in particular and the historical avant-garde in general. Their books are purposefully accessible works that nevertheless seek to acknowledge the status of language as medium and the self as socially enmeshed. I read Rankine and Nelson’s works of prose poetry in particular as occupying the space where the no-longer-new sentence was; they are instances of a consciously post-avant-garde writing that refuses—without in any sense being simple—to advance formal difficulty as a mode of resistance, revolution, or pedagogy. I will also try to suggest how they operate knowingly within—but without succumbing to—a post–Language poetry environment of lyric shame or at the very least suspicion. I call Rankine and Nelson’s books works of “prose poetry,” and they are certainly often taken up as such, but their generic status is by no means settled. Both writers—as with many Language poets—invite us to read prose as a form of poetry even as they trouble such distinctions. Rankine’s books are indexed as “Essay/Poetry” and Bluets is indexed as “Essay/Literature.” Bluets is published, however, by Wave Books, a publisher devoted entirely to poetry. Rankine’s two recent books are both subtitled “An American Lyric,” begging the question of how a generic marker traditionally understood as denoting short, musical, and expressive verse can be transposed into long, often tonally flat books written largely in prose. On an obvious but important level, I think the deployment of the sentence and paragraph under the sign of poetry, the book-length nature of the works in question, and the acknowledgment of the lyric as a problem (and central problematic) help situate these works in relation to the new sentence, even if that’s by no means the only way to read them. There was a time I could say no one I knew well had died. This is not to suggest no one died. When I was eight my mother became pregnant. She went to the hospital to give birth and returned without the baby. Where’s the baby? We asked. Did she shrug? She was the kind of woman who liked to shrug; deep within her was an everlasting shrug. That didn’t seem like a death. The years went by and people only died on television—if they weren’t Black, they were wearing black or were terminally ill. Then I returned home from school one day and saw my father sitting on the steps of our home. He had a look that was unfamiliar; it was flooded, so leaking. I climbed the steps as far away from him as I could get. He was breaking or broken. Or, to be more precise, he looked to me like someone understanding his aloneness. Loneliness. His mother was dead. I’d never met her. It meant a trip back home for him. When he returned he spoke neither about the airplane nor the funeral. 70. Am I trying, with these “propositions,” to build some kind of bower?—But surely this would be a mistake. For starters, words do not look like the things they designate (Maurice Merleau-Ponty). 71. I have been trying, for some time now, to find dignity in my loneliness. I have been finding this hard to do. 72. It is easier, of course, to find dignity in one’s solitude. Loneliness is solitude with a problem. Can blue solve the problem, or can it at least keep me company within it?—No, not exactly. It cannot love me that way; it has no arms. But sometimes I do feel its presence to be a sort of wink—Here you are again, it says, and so am I.
Nelson’s “blue bower” evokes not only the actual bird, renowned for how the males construct and decorate “bowers” to attract mates, but also the traditional association of lyric with a metaphorics of birds and birdsong. It further evokes the Dante Gabriel Rossetti (a shamelessly lyric poet if there ever was one) painting of that name, as well as his poem with the received title “The Song of the Bower.” To build a “blue bower” out of “propositions” is to cross a lyric and anti-lyric project in the space of prose, implicating and complicating both. It is hard to find dignity in the privacy of the aestheticized bower—indeed, one might be ashamed of such inwardness—and one of the goals of Bluets will be to test what part of experience is sharable as a way out of isolation and despair. The color blue functions as the organizing metaphor for both the possibility of intersubjectivity (“15. I think of these people as my blue correspondents, whose job it is to send me blue reports from the field.”) and its limits (“105. There are no instruments for measuring color; there are no ‘color thermometers.’ How could there be, as ‘color knowledge’ always remains contingent upon an individual perceiver.”). Nelson’s accumulating “propositions” do not integrate into a “bower,” but the relation between sentences and sections has little in common with new-sentence disjunction. As in Rankine’s prose poetry, difficulty here is not deployed as a political/poetical tactic irrupting within the norms of prose; instead, the difficulty of finding a defensible, dignified ground for intersubjectivity is narrated explicitly. The shift from the tactical deconstruction of ostensibly natural narrative or lyric unities to the effort to reconstruct them with a difference is legible in part because Bluets foregrounds its relation to avant-garde prose poetry. Nelson’s use of Wittgenstein as muse and model, for instance, invites us to position her work relative to new sentence experiments. Silliman not only cited the Philosophical Investigations in “The New Sentence” as an important precedent, but Silliman’s own The Chinese Notebook models the tone and structure of Wittgenstein’s philosophical writing. More generally, the work of Marjorie Perloff (Wittgenstein’s Ladder) and others has made clear how the philosopher’s inquiries into language as a form of social practice—and his own peculiar linguistic operations—have been central to scores of experimental (“difficult”) writers. If Nelson weren’t also the author of volumes of verse, and if Wave weren’t the publisher of Bluets, my experience of context and thus text would be different: those facts function as a quieter version of Rankine’s subtitle, inviting—or at the very least enabling—us to think of poetry as a reading practice as much as a writing practice, and to experience verse techniques as withheld or unavailable in Bluets instead of as merely forgone or forsworn. As in Don’t Let Me Be Lonely, in Bluets, actual verse is exiled to the space of citation: William Carlos Williams, Lorine Neideker, and Lord Byron, among many others, are quoted; line breaks are replaced with slashes. Indeed, Nelson doesn’t have much faith in the effects of actual poems: “12. And please don’t talk to me about ‘things as they are’ being changed upon any ‘blue guitar.’ What can be changed upon a blue guitar is not of interest here.” Or: “For better or worse, I do not think that writing changes things very much, if at all” (proposition 183). And yet, the relegation of verse to the virtual space of citation lends it a certain power, displaying it while also insisting that it’s nearly out of reach. This allows Nelson’s prose to be haunted by the abstract possibility of a poetry it can’t actualize, somewhat like the Mallarméan fantasy she at one point describes: “For Mallarmé, the perfect book was one whose pages have never been cut, their mystery forever preserved, like a bird’s folded wing, or a fan never opened.” Moreover, Bluets—taking its cue (and lifting many of its locutions) from Wittgenstein’s attacks on Goethe’s Theory of Colors—often refers to outmoded regimes of knowledge or technologies (e.g., the 18th-century “cyanometer,” which sought to measure the blue of the sky). One begins to wonder if verse—lyric poetry in particular—is another set of defunct measures, outmoded conventions for communicating experience. Perhaps there is a sense for Nelson (and Rankine) in which poetry isn’t difficult—it’s impossible. There is faith neither in poetry’s power of imaginative redescription (the blue guitar) nor in its practical effects as a technology of intervening in history (“I do not think that writing changes very much”). The subject isn’t a dominant bourgeois fiction of inwardness and univocality in need of deconstruction via new sentence difficulty but an avowedly social and linguistic entity deployed over time in the space of writing; expression itself must be constructed, and that process is narrated clearly in a prose that, when read as poetry, makes actual verse present as a loss. Although I believe these authors use the prose poem and the felt absence of verse in fresh and specific ways, I am not suggesting that the logic I’m describing is exactly new. Stephen Fredman and others have suggested that the prose poem arises as a form during periods in which there is a crisis of confidence in verse strategies, and the notion of the lyric being felt as a loss as it becomes prose is at least as old as Walter Benjamin. Here my limited goal is to indicate a few specific ways the new sentence valorization of difficulty can become a frame for a specific kind of accessibility for two important contemporary poets who write primarily in prose. its specious belief that renouncing subject and voice is anti-authoritarian, when in fact such wholesale pronouncements are clueless that the disenfranchised need such bourgeois niceties like voice to alter conditions forged in history. The avant-garde’s “delusion of whiteness” is the luxurious opinion that anyone can be “post-identity” and can casually slip in and out of identities like a video game avatar, when there are those who are consistently harassed, surveilled, profiled, or deported for whom they are. In a related vein, Nelson’s own work as a critic has been attuned to how “the male Language writers’ occasionally monomaniacal focus on warring economic systems” was both challenged and expanded by women writers inside and outside of the Language movement itself. In ways I haven’t had the space to explore here, Don’t Let Me Be Lonely and Bluets are engaged with demonstrating how the uncritical acceptance of voice and narrative conventions as well as their “wholesale” disavowal by certain avant-garde writers can preserve racist and sexist ideologies. This is by now an old difficulty, echoing the even older modernism/realism debate—how the emancipatory potential of poststructuralist strategies quickly cools into a conservatism (or worse) like the one Cathy Park Hong describes. Out of this abiding difficulty more complex, accessible prose poetry is likely to arise. How might verse return? And when and why? Gillian White, LyricShame: The “Lyric” Subject of Contemporary American Poetry (Cambridge, Mass. : Harvard University Press, 2014). Claudia Rankine, Don’t Let Me Be Lonely (Saint Paul: Graywolf, 2004), 5. Rosmarie Waldrop’s trilogy, Curves to the Apple (New York: New Direc- tions, 2006), which often lifts Wittgenstein’s propositions and submits them to a process of substitution (e.g., Wittgenstein’s “The deepest questions are, in fact, no questions at all” becomes “The deepest rivers are, in fact, no rivers at all”) is a beautiful example of how Wittgenstein has functioned as (sometimes antagonistic) inspiration and source material for innovative poets. Cathy Park Hong, “Delusions of Whiteness in the Avant-Garde,” Lana Turner 7 (2014): 248–53, quote from p. 248. From The Fate of Difficulty in the Poetry of Our Time, ed. Charles Altieri and Nicholas D. Nace. Used with permission of Northwestern University Press. Copyright 2017 by Ben Lerner. Vivian Wagner is an associate professor of English at Muskingum University in New Concord, Ohio. Her essays have appeared in The Kenyon Review, Zone3, McSweeney’s, Silk Road Review, and other journals, and she’s the author of Fiddle: One Woman, Four Strings, and 8,000 Miles of Music. I started reading Maggie Nelson’s Bluets this spring on my way to AWP in Minneapolis for the weekend. Feeling restless on the airplane, I downloaded it onto my iPad and began reading. I read and read, all the way to Minneapolis. I glanced up now and then to see the sunset over the prairie of clouds, to see the plane descending through grayness into the city, to see the inexorable approach of the runway. After each glance up, I’d fall back into the book. Early this morning, I saw the first of my Alaskan wildflowers blooming in my Ohio garden: a blue flax. It had a small yellow center and fine purple lines radiating outward. Delicate and strong, it fluttered in the cool breeze. I’m easily distracted, as a reader, as a writer, as a person. Bluets speaks to me partly because it lets me read in bits and pieces. To read and then look out the window. To think and then read again. To let my mind wander and then focus. In second grade, my teacher wrote a note to my parents on my report card: “Vivian tends to daydream.” That word — “daydream” — caught my imagination. I’d never heard it before. I asked my mom what it meant, and she said it meant I didn’t pay enough attention. I realized then that the teacher was right. I thought of all the time during class that I gazed out the window, listening to the desert wind blow sand against the glass. I paid attention, but not always to what the teacher wanted me to. I daydreamed. My writing has been influenced irreversibly by Bluets. The book has freed me from thinking that narratives must be linear and chronological. I knew this prior to reading Bluets, I suppose, but this book helped me to feel it, to understand it. And, perhaps most importantly, to practice it. Bluets’ numbered sections work well on an iPad. I’m not particularly proud of the fact that I first read this book in its digital version, but this book grew out of the digital age, with all of its demands and tabs and windows. I’ve been making recycled paper lately with old bills and junk mail. It’s calming and engrossing. I love how the slurry dries and reveals a few single letters here and there – random a’s and d’s and z’s. Sometimes I mix violets, clovers, and grass in with the paper. A few days ago I accidently mixed in a small flying insect with a handful of leaves. I found it in the paper, its delicate wings outstretched, flattened. I felt bad. I wished I had looked more carefully at what I had gathered, what I had thrown in. After I make the paper, I stitch it into small journals and chapbooks. I have many of them now, waiting for words. I’m going to Alaska this summer to spend time with my boyfriend. He’s a pilot, an engineer, a photographer, an explorer. I love his dark, kind eyes. The way he’s always up for an adventure. The way he’s always in the moment. The way, when I’m writing, he sits by me quietly – reading, gazing out at the water, puzzling over his own projects, thinking his own thoughts. I love being with him. Bluets doesn’t have a story, exactly. At least, it’s not a story in the traditional sense of that term. It’s composed of 240 fragments, facts, details, observations, and story-bits. Together, they add up to what might be considered a narrative about a lost relationship, about the regaining of a sense of self, about depression, about hope. Now that I’ve finished the book, I like to dip back in and read a passage here and there. Maybe the one about bower birds. Or about Derrida. Or about Cézanne. Or about cyanometers. Or about Gertrude Stein’s Tender Buttons. Each one stands alone, and yet each one belongs with the others. The blue flax flower in my garden still blooms now, in the early afternoon. The sun’s reached its petals, slightly brightening their shade of blue. In a few days, this particular flower will stop blooming and go to seed, but I see another bud near it, slowly unfurling, waiting for just the right moment to open up.